The editors of the SLHTA’s annually published magazine, La Belle Helene, only select the most eye-catching images for the publication’s cover. The idea is to capture and display the essence of Saint Lucia’s culture and beauty. 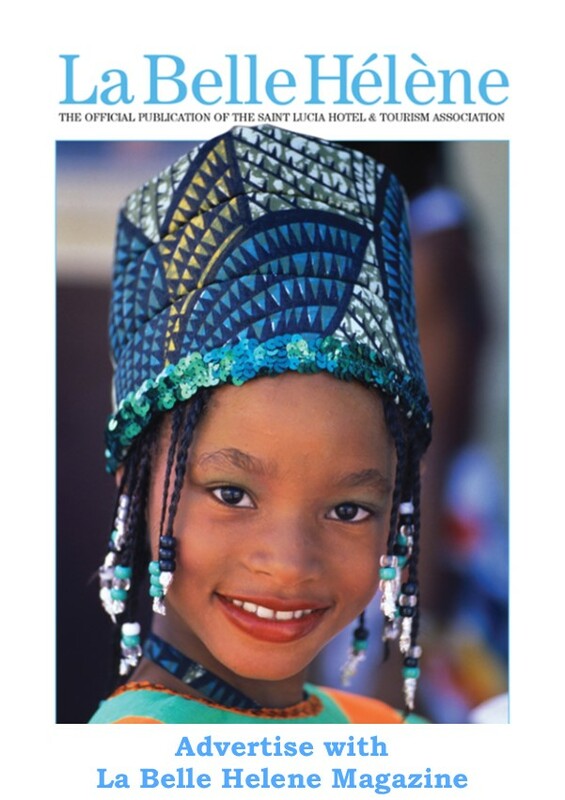 Last year, when SLHTA’s Board of Directors curated, from their archive, a group of possible photos to be used for the magazine’s 2019 issue cover, it was the wide smile and bright-eyes of a little girl decked in cultural print that stole their hearts. 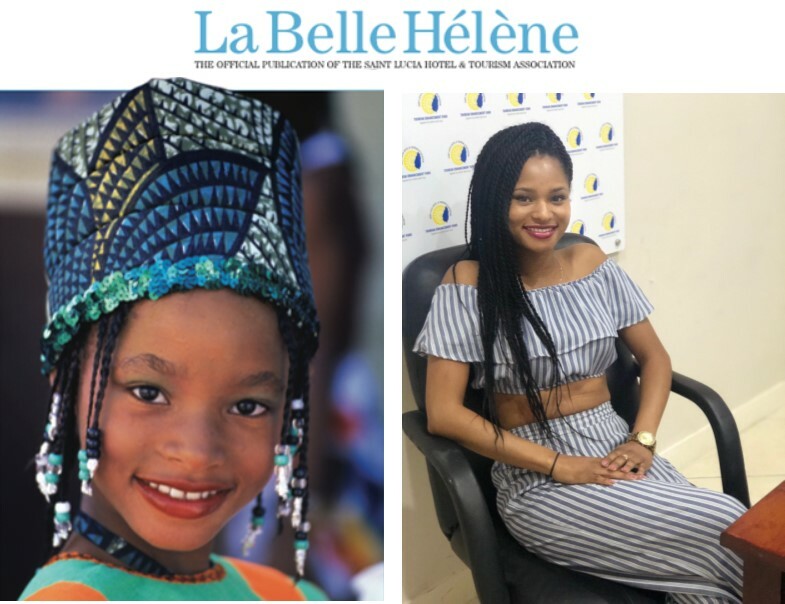 Once the 2019 edition of La Belle Helene was published and distributed, Saint Lucians, as expected, gravitated to the cover. One comment submitted through Facebook however, stood out most to Wendel George, SLHTA’s Project and Social Media Co-Ordinator, “Chrissy’s mom commented and said, ‘Hey, that’s my daughter’ and I believe she shared it on her Facebook page. I eventually saw the comments from Chrissy, her family and her friends teasing her, saying that she looks the same, has the same smile and so on.” George made contact with the girl’s mother and eventually with the cover-star herself, who was not the infant school student they had all expected, but rather, a flourishing 29-year-old woman. Yet, hardly did he know then—before her sit down interview—the incredible journey of the still beaming, bright-eyed, Chrissy Gabriel. Gabriel grew up in Saint Lucia, where she lived with her aunt and role model Beverly Dieudonne. Dieudonne—also the current principal of Camille Henry Memorial School— was actively involved in Saint Lucia’s creative industry and fostered her niece’s appetite for culture. (Gabriel explained that the famous cover photo was taken while she played mas in her aunt’s kiddies carnival band 23 years ago). At the age of eight, she moved to New York where she stayed till her tenure at FAMU (Florida Agricultural & Mechanical University), setting her enroute to obtaining an undergraduate degree in Agro-Business. By her Junior year of college however Gabriel felt a longing to return to the only place she called home, Saint Lucia. “Love made me want to come back; the love for my family, having been away for so long and then there was love-“love.” It definitely brought me back; it kind of always does, doesn’t it?” Gabriel shared. On her return to the island, she enrolled at Monroe College, where she finished her degree. To make ends meet, a then 20-year-old Gabriel landed a marketing job for Sarah’s Juice (Crown Foods). During a product exhibition she met Wayne Whitfield, Managing Director at Mediazone Productions Inc. and Choice TV St. Lucia. Whitfield was sold on the young woman’s charm and asked if she would be interested in testing for a commercial. Not only did Gabriel ace but it also sparked her long career in television. She went on to host the TV Shows Unscramble It and subsequently Jazz Files on Choice TV St. Lucia.“I got to interview Keri Hilson, Melanie Fiona, and the list goes on; it was a wonderful experience,” she admitted. The move though was not void of challenges. “When I was in California, it was a little bit like ‘small fish, big pond’ and I was a bit intimidated. I wondered, ‘How can I continue this desire to want to be on the big screen when the competition was so high?’” Gabriel explained. It did not take long before she figured it out; she would start from behind the scenes working as a Production Assistant and then an Assistant Director. “I started out as a production assistant … that job went really well and it escalated after that,” she continued. The stars continued to align in her favour and she received opportunities to pursue her interests: “I met one Director that loved working with me and she said, ‘Hey, we have a gig in New York for Project Runway All Stars, if you can get to New York, we will give you the job.” And so, Gabriel packed up her things and headed to New York. Gabriel then spent her days absorbing everything related to accounting that she could set her eyes on. When Julie’s appreciation for the budding accounts specialist’s work ethic peaked, she introduced Gabriel to her own mentor, Cynthia L.
The trust between Julie and Cynthia resulted in a subsequent path being forged for Gabriel, which led her to the production of “The Break”—a Netflix series—hosted by Michelle Wolf. Her days became all about managing payrolls and other monetary transactions—a cumbersome task considering that the shows’ employ and do business on a global scale. Yet, while she enjoyed her growing career, it was the lessons learned from the women around her that moved her most. “Cynthia is also a mom so it was amazing for me to be able to talk to her about my desires. Not only was she a mom in the workplace but she was also the Finance Director at the time. I asked her, ‘How are you a Finance Director, how did you get to this position, you’re a mom of two and you’re married. How is it that you’re managing a household and also managing this large account? And she said ‘Chrissy, they need you; They need you more than you need them,” Gabriel recalled. To emphasize the reason the notion instantly struck a chord with her, she continued to explain; “Something that as women we don’t do; we’re not very vocal about our needs, but we have to start speaking up about what we need from our jobs.” For instance, unlike the traditional belief that time off must be formally requested and permitted, “She [Learner] said, ‘No. You let them know that “xyz” has happened; I need to get the time off, but the work will get done,” Gabriel proclaimed the advice that shifted her perspective forever. She then mentioned that the same principles apply when negotiating things like pay and benefits. When she was not soaking up valuable lessons from the other successful people within her network, Gabriel busied herself on the sets of two other Netflix shows; David Letterman Season 2 and Pandemic. “I really love it,” she confessed. 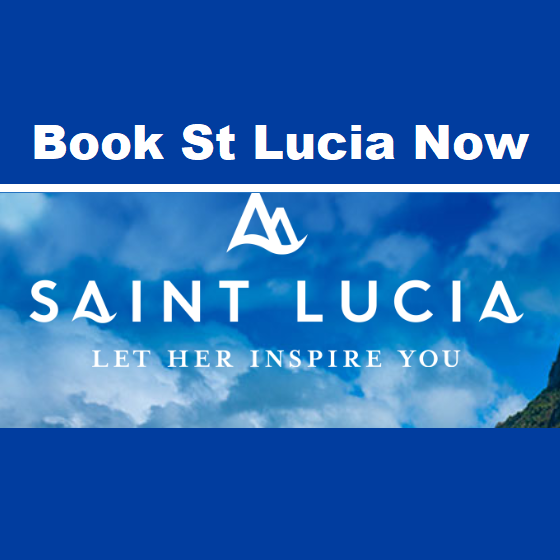 Still crowned with an infectious smile and gleaming eyes, the daring Saint Lucian noted that she is always open to new opportunities. If, for instance, it is written in her future to get back in front the camera, she says, she will be open to it. 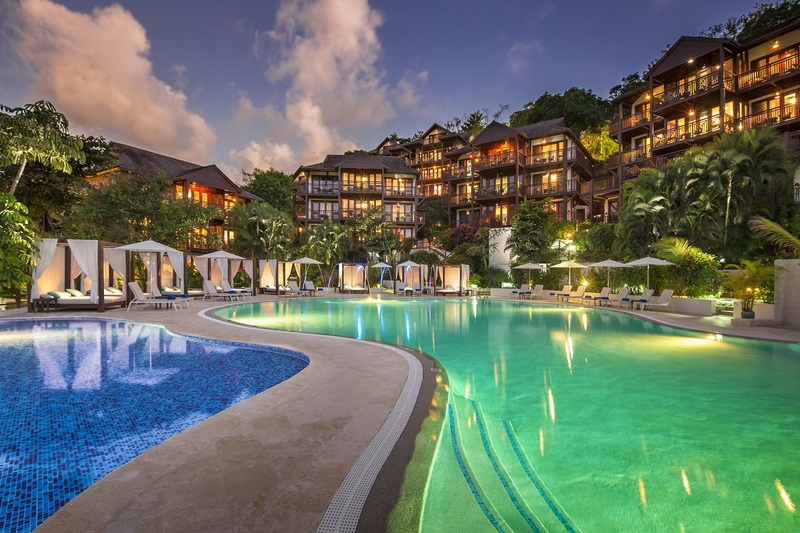 However, her deepest desires for 2019 are set with Saint Lucia in sight. She now feels the urge to help out at home and has viable ideas to do so, while still continuing her work with Netflix. Whatever the path, undoubtedly Crystal “Chrissy” Gabriel, will eternally have a powerful, first-hand testimonial, on how courage, sacrifice and discipline are essential ingredients for success.